Kristen Mcginnis is not only an incredibly talented interior designer here in New York City but she also happens to be one of our dear friends. Kristen was just featured in the latest issue of W magazine and we couldn't be more excited for her. 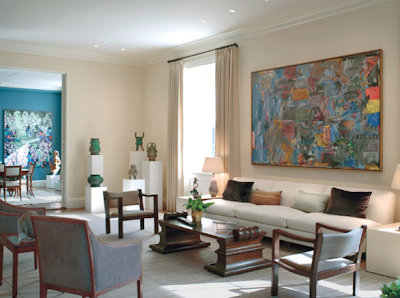 Here is an apartment she did for Agnes Gund, former president of the Museum of Modern Art , and needless to say the art alone is beyond impressive. But the way Kristen managed to balance this extraordinary collection with the architecture and furnishings in such an understated manner is what we find truly remarkable. This space could have easily taken on a stark, gallery-like appearance with the focus soley on the art, but instead there's a warm, inviting presence that complements the art as well as Ms. Gund herself. We're most excited by the wall color in the dining room which Kristen developed with the help of master colorist Donald Kaufman. 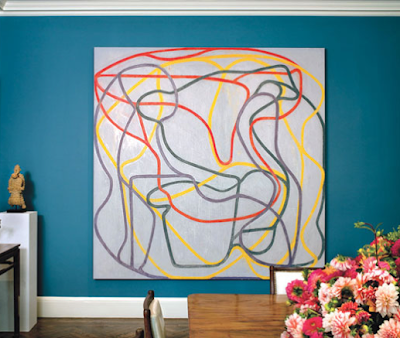 That particular shade of blue not only complements the Roy Litchenstein and Brice Mardern paintings perfectly but also helps showcase the incredible archtiectual detailing without letting the room take itself too seriously. Nice job Kristen! To read the entire article click here. what a serene space! kristen mcginnis is talented! 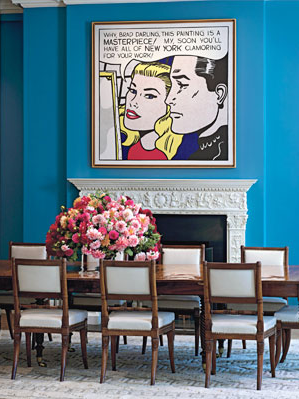 love the paint color in the dining room...would love a whole entry on the process of working with master colorist Donald Kaufman.